While historically difficult to get rid of, chest wrinkles are no longer impossible to treat thanks to recent advancements in technology. Second only to the face, the chest is one of the most susceptible areas of the body to wrinkles caused by sun damage and natural aging. With age, the body slows its collagen production, which leads to crepey wrinkles and less elasticity in the skin. The cleavage region is especially vulnerable to wrinkling due to breasts pulling chest skin downward. Just like the sensitive skin on your face, the chest is often exposed to damaging UV rays that can cause long-term wrinkling and sagging. You may have heard of doctors using CO2 lasers, carbon dioxide lasers that superficially vaporize skin, and other non-ablative laser techniques to treat wrinkles. These treatments are particularly popular for the management of facial wrinkles, but can be used to treat chest wrinkles and skin discoloration that occurs from sun damage as well. The YAG Laser is a popular option to address cleavage wrinkles. This procedure resurfaces the skin and effectively treats moderate surface wrinkles and scars. No matter which laser treatment your doctor recommends, you will most likely require two to six sessions in order to achieve your desired results. While laser treatments alone typically won’t address sagging or excess skin, they are generally considered effective at removing surface wrinkles. Plus, they can be paired with skin-tightening treatments in instances where you also want to tighten and smooth the chest. Cost: Ranges from $75 to $6,000 depending on your location and how many sessions are required. Chemical peels are often touted as one of the best ways to treat chest wrinkles. These formulas utilize acidic chemical components — glycolic acid, lactic acid, salicylic acid, trichloroacetic acid and others — to remove the outermost layer of the skin and reveal a younger, fresher dermal layer. These treatments are especially beneficial for treating actinic sun damage, which can compromise your skin after too much exposure to photochemicals and UV rays. Estheticians often employ the same chemicals used on the face for chest and collarbone areas. The downside of this treatment is that it typically requires multiple applications to achieve the desired results. Most people require three or four peels administered several weeks apart to thoroughly smooth the skin. Unfortunately, chemical peels cannot be used by everyone. They’re not often recommended for people with darker skin, and generally don’t produce the best results when treating sagging skin and severe wrinkles. Cost: Ranges from $100 to $1,600 depending on your location, how many treatments are required, and the specific treatment type. Dermal fillers and relaxers — like Botox and Restylane — are commonly used to treat those stubborn deep wrinkles on the face, but there are plenty of injections you can use to achieve flawless, wrinkle-free skin in the décolletage area, too. Options include hyaluronic acid gel fillers — like Juvéderm and Restylane — and options such as L-lactic acid fillers — Sculptra. Your dermatologist will be the best person to determine which option is best for your particular situation. The main downside of chest wrinkle fillers is that, just like facial fillers, they aren’t permanent. Depending on which filler you use, you can expect to see results for between six months to two years. As a result, this treatment is most popular among those who prefer investing in a long-term maintenance plan rather than a one-time, quick fix. That being said, fillers do provide immediate results and require zero downtime post-injection. Cost: Ranges from $400 to $2,000 depending on how many injections and treatments are needed. This treatment option is popular with those who want to fill and plump their face, but is also recommended for achieving the same smooth, plump, and youthful results in the chest. This procedure requires the transfer of fat from areas where you have additional fat — the abdomen, thighs, and arms are popular options — into areas that are lacking volume, such as the chest. Those who want to remove a little bit of fat from another area of the body will definitely want to consider this treatment. Fat transfer is a bit more complicated and costly than the other treatments on this list. It requires patients to undergo anesthesia, either local or general, which sometimes causes complications. Additionally, there is a much longer and more complicated recovery process with this type of wrinkle treatment than with lasers, fillers, creams, and other options. Fat grafting also doesn’t address age related sun damage, such as uneven skin or dark spots, in the way that chemical peels or lasers can. Cost: Ranges from $4,000 to $8,000 depending on how many areas are treated and which type of anesthesia is used. There are thousands of anti-aging creams on the market that can be used to help correct fine lines and chest wrinkles. Skin care products fortified with time-tested anti-wrinkle ingredients — primarily growth factors, retinoids, vitamin A, alpha hydroxyl acids (AHA), kinetin and copper peptides — yield the best results. A good chest wrinkle cream will restore the skin cells’ ability to produce collagen and other components that help fight wrinkles. These creams should keep skin looking smooth and beautiful. Many doctors will prescribe high grade anti-wrinkle creams, which typically include tretinoin. This medicinal ingredient is similar to retinol — they’re both in the vitamin A family — but it’s significantly more aggressive, making it good for more extreme wrinkling cases. Doctors often recommend tretinoin prescriptions for people who want to smooth fine lines and wrinkles on the face, chest, and neck. You should always test new products on a small and inconspicuous area of the body to avoid any serious allergic reactions. Cost: Ranges from approximately $20 for drugstore brand anti-aging creams to several hundred dollars for premium products and prescriptions. If you’re looking for another non-invasive chest wrinkle treatment, you might want to give décolletage pads a try. These pads are typically made with 100% medical-grade silicone and are designed to fight wrinkles, sunspots, and other concerns caused by aging and sun damage. To use them, simply place the silicone pad on the treatment area while you sleep. 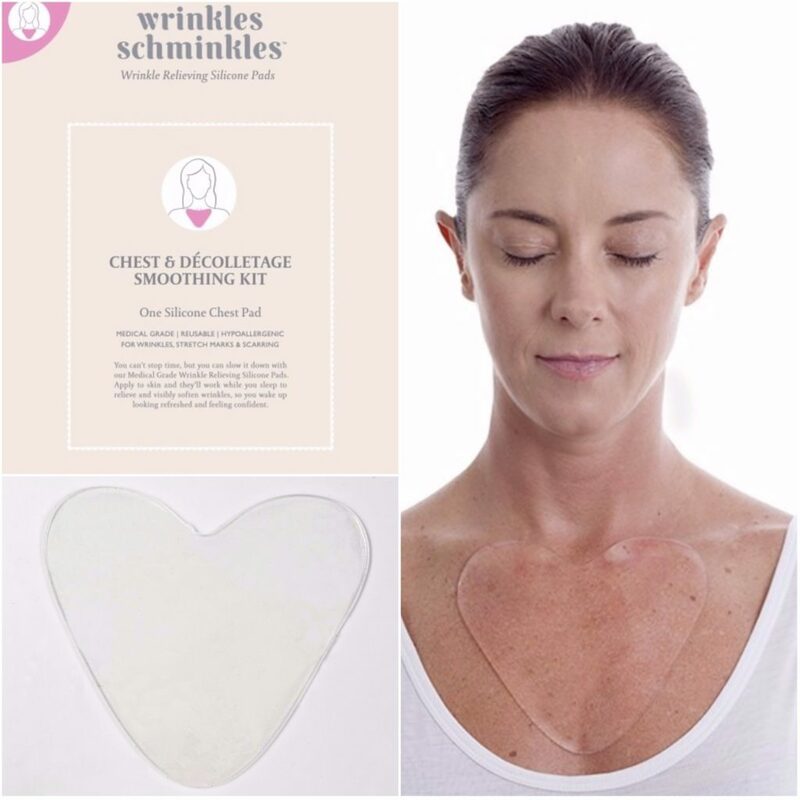 You can purchase silicone wrinkle pads specifically for chest wrinkles — such as Wrinkles Schminkles’ Chest & Décollectage Smoothing Kit — or choose other styles for the face and other wrinkle-prone regions of the body. According to studies, 100% grade silicone pads are an effective way to improve collagen production in many scar treatments. These products apply this same logic to wrinkles. Wrinkles Schminkles claims that by using their products, you can literally wake up looking younger than when you shut your eyes. “In addition to treating the scar-like wrinkles by drawing hydration to the skin’s surface and stimulating bloodflow, [Wrinkles Schminkles] pads also prevent the skin from creasing while you sleep, which gives the skin the break it needs to heal,” says Dr. Kristen Forman, a board-certified dermatologist based in Newport Beach, CA. You can pair these products with age-fighting creams and cleansers for even better results. These anti-wrinkle pads are appropriate for anyone looking for a non-invasive, affordable way to treat wrinkles on their chest, neck or face. There’s still a lot of uncertainty surrounding whether or not these pads actually work, but the dominant hypotheses is that the silicone helps encourage the body’s ability to produce more collagen, which leaves the chest with smoother and younger-looking skin. Cost: Ranges from $20 to $40 per pad. Want to treat sagging skin alongside wrinkles and sun damage? In addition to aging and sun damage, sagging skin is also caused by extreme weight loss. Luckily, there are several options for treating wrinkled and sagging chest skin simultaneously. Many of these wrinkle fighting treatments can be combined with Ulthera, and other skin-tightening treatments, to help address stubborn sagging chest skin. Ulthera is a non-surgical treatment that utilizes ultrasound energy to naturally lift and tighten the skin in the chest and neck. Most doctors will also recommend creams alongside most treatment options. With the right combination of treatments, you really can achieve healthy skin in your chest area. Though this article is mainly about treatment, it is important to note that prevention, if still possible, is the best option. If you’re seeking a great way to prevent chest wrinkles, make sure to invest in a good-quality sunscreen and moisturizing anti-aging creams that fight wrinkles.